The Daytona 500 became popularized as the “Great American Race” in the 1990s. 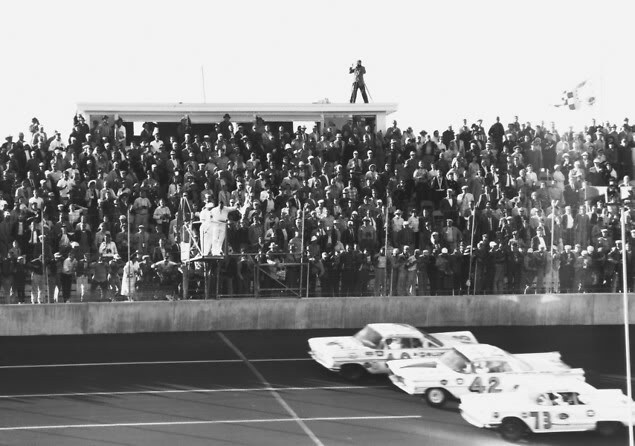 It got off to a showy start when drivers ran the inaugural event on February 22, 1959. It was the second race on that year’s schedule sanctioned by the National Association for Stock Car Auto Racing (NASCAR). It was the first race hosted by the then brand-new, 2.5 mile Daytona International Speedway. More than a third of the cars that started the event were actually convertibles. Spectators were treated to a race where the drivers never slowed down. The first Daytona 500 ran caution-free from start to finish. Three hours, 41 minutes, and 22 seconds later, Lee Petty took the checkered flag in a photo finish alongside Johnny Beauchamp, then watched his rival enjoy the spoils of victory lane when Beauchamp drove his car there first. It took NASCAR three days to announce the real result. Newsreels and photographs upheld Petty’s claim that he was the real winner. The combination created a sense of drama that helped establish the legend of stock car racing at the Florida track. Petty’s son Richard, later to become crowned “the King” of stock car racing, finished 57th out of the 59-driver field, behind the wheel of a stock-modified ragtop.